Review by Lisa McCrink, YSS Committee. Event organised by Lisa McCrink (YSS & CenSSOR), Laura Boyle, Conor Donnelly and Sophia Halliday (CenSSOR). 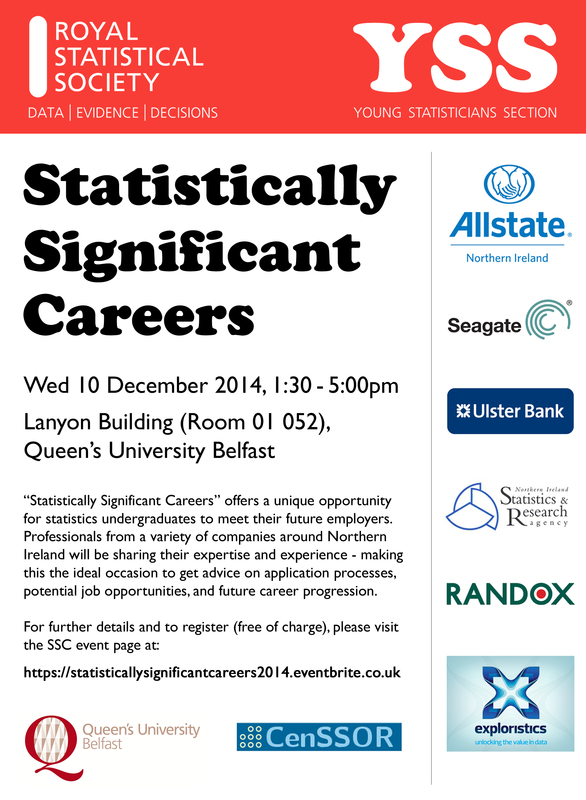 On 10 December 2014, the YSS joined together with the RSS NI local group to host the first Statistically Significant Careers event – and what a success it was! Borrowing ideas from the popular Statistical Showcase event run by the YSS at the RSS headquarters in London each year, the Northern Irish version did not disappoint. Companies from throughout Northern Ireland came together to showcase the wide range of statistical careers available locally, enlightening 58 delegates about the possibilities available to NI statisticians. Held at Queen’s University Belfast, the event was kindly sponsored by the university’s Mathematics and Physics Department alongside the RSS NI local group. The line-up of presenters was mainly composed of local graduates and career-young statisticians who in the past few years have started on their career paths, and thus well placed to give great advice to those in attendance. The event was opened by Professor Adele Marshall, director of the Centre for Statistical Science and Operational Research (CenSSOR) at Queen’s University Belfast, who gave an inspirational speech about the use of statistics in the modern world. Following this introduction, Lisa McCrink, Meetings Secretary of the YSS, then spoke about the various events and initiatives run by the section throughout the year. Particular emphasis was given to the great success of the annual YSS/Significance magazine Young Statisticians Writing Competition, highlighting how last year’s winning articles now had write-ups in the Wall Street Journal, New York Times and The Guardian (to name but a few). Lisa encouraged everyone to see what impact their articles could have in this year’s competition (deadline coming up soon – 30 May!). The company representatives then took over, with the audience enjoying talks from seven companies based throughout Northern Ireland, all of whom have a keen interest in the use of innovative statistical techniques to solve a wide range of industrial problems. The companies included Allstate, Ulster Bank, Randox, NISRA, Seagate, Exploristics and Queen’s University Belfast. Each company delivered an engaging and motivating 20 minute talk, with time afterwards for questions. With many companies sending several representatives, the audience had many perspectives and gained plenty of valuable advice regarding the various opportunities each company had to offer. The discussions continued as lively conversations during the coffee break – which was also a great opportunity for attendees to meet fellow career-young statisticians. Big thanks to our sponsors and all the companies who participated! The event was deemed a great success – and based on the positive feedback from attendees, a similar event will be run again in a year’s time. The organising committee are looking forward to the second Statistically Significant Careers event which will take place at Queen’s University Belfast in October 2015. If you would like to get involved or to hear more about the event, just get in touch by emailing Lisa McCrink (l.mccrink@qub.ac.uk). Please click on the image above for full details! Review by the webinar organiser, Sofya Gorelova. 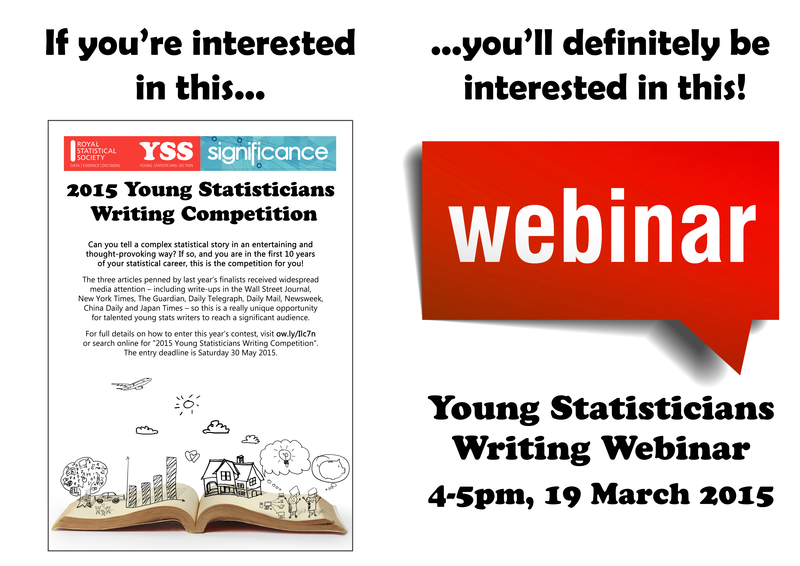 On 19 March, the YSS hosted our first ever webinar, with over 50 participants! The event was a very popular one and generated really positive feedback. The goal of the event was to complement the current YSS / Significance 2015 Young Statisticians Writing Competition by bringing together some great speakers who would share their experiences and advice on science journalism, as well as providing a forum for anyone to ask questions related to the competition. Our first speaker was Brian Tarran, the editor of Significance Magazine, who delivered a great introductory presentation covering the details of the competition and how to get involved. Jonathan Auerbach followed up with an entertaining talk describing how he went about writing last year’s winning competition entry, “Does New York City really have as many rats as people?”. Robert Matthews then rounded off the trio of talks with some great journalism tips based on his many years of experience as a successful science writer. The second part of the event was a live Q&A session where participants could question the presenters over the phone or via the webinar chat facility. A large number of varied and interesting questions came in, and were superbly fielded by all the speakers. 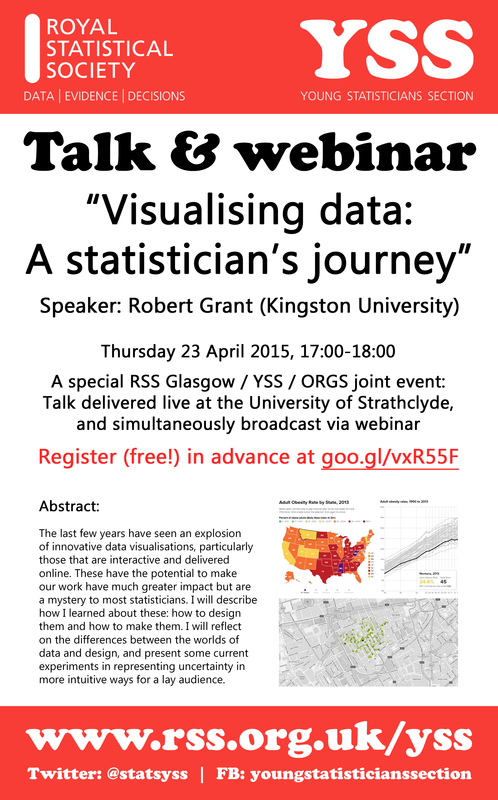 Don’t forget to sign up for our next free webinar on Thursday 23 April: “Visualising data: A statistician’s journey”. Full details are available here.